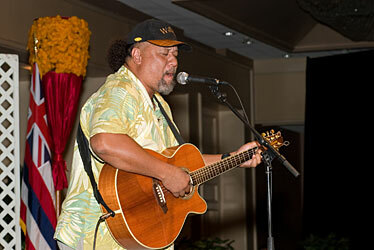 Willie K. enlivened the annual luncheon of the Hawaii Visitors and Convention Bureau on Wednesday. If Downtown looked empty on Wednesday at noon, it's because more than 900 people turned out for the annual luncheon of the Hawaii Visitors and Convention Bureau at the Hilton. This was the 105th annual HVCB lunch -- odd since the bureau was founded in 1945. "We used to have two of these a year," said President John Monahan. "Count your blessings." "We know most people come to the lunch because they gotta. Somebody bought a table," said bureau Vice President Jay Talwar. "We wanted to make it at least a little fun." The bureau showed its latest promotional videos, the last featuring Willie K. As the lights came up, there was Willie himself on the stage, doing his manic Maui musical thing. When the audience shuffled to its feet at the end of the performance, Willie segued into "Hawaii Aloha," the only time I've ever seen that audience stand, hold hands and sing with enthusiasm. "The good news is I've been promoted," said Tom Mullen, longtime head of American Express here. "The bad news is I have to move to Los Angeles." All is not lost. "I told them I wouldn't take the job unless I kept Hawaii as part of my territory," he said. "I'll be back at least four times a year." Should you wish to congratulate, or console, Mullen, he and wife Marty will be hosting the Hale 'Aina Awards fundraiser, tonight at the Royal Hawaiian. New York stagehands went on strike last week. All but eight theaters closed -- just as DHT's Deena Dray arrived with 31 Hawaii residents on Diamond Head Theatre's annual New York theater tour. The group scrambled to book alternative shows, including Radio City Music Hall's Christmas Spectacular. One tour member took off for Atlantic City, others got a heavy dose of museums. "Last year people complained there was no free time to go shopping," said Dray. "This year they complained they overshopped." David Paul's Lahaina Grill becomes simply Lahaina Grill on Dec. 1. The classic bistro was purchased from David Paul Johnson by Jurg Munch, a Swiss chef by way of Hong Kong, eight years ago. At the time, fearing a backlash from an ownership change, Munch licensed the name. Now, with the restaurant packed and winning awards, Munch feels secure enough to drop the David Paul's. "Nothing else changes," he said. But that leaves hundreds of items, from signs to menus, that Munch has to pay to redo. "I'm Swiss and frugal," he said. "I thought using all the old stuff and just crossing out the name. Don't mention that to my wife. She would have done it. She's Chinese." Murphy's is almost old enough to drink. Don Murphy's Irish pub celebrated its 20th anniversary Friday in fine Murphy's fashion, with a block party, a UH game on TV and gallons of Guinness. "A crazy, wonderful 20 years," said Murphy. In that time, the watering hole has hosted thousands of business and birthday and goodbye-and-good-luck lunches. It's seen wakes (Dave Lyman, Dave Donnelly), weddings and many betrothals -- including Murphy's to then-hostess, now wife and sometime hostess, Marion. A generous spirit turned the pub into a community center. Most people, when they read a story of misfortune in the newspaper, feel sad. Murphy throws a fundraiser -- and throughout the decades has raised $2 million for everything from UH athletics to an Irish tourist who lost her legs in a Big Island car accident. It's also been fun. One Kentucky Derby party featured a live horse in the bar. "I'd never been in this business before," said Murphy. "One of my friends said, 'Look out, open a bar and you'll be drunk for a year.' He was only off by 19." What are you doing New Year's? Got $5,000? That's the price for the top New Year's VIP package from the town's maestros of nightlife, Flash and Matty Boy. Last year, Flash and Matty Boy's party filled up the W's Diamond Head Grill early in the evening. They had to turn away revelers. This year, they've bought out the whole hotel, every room, every dinner in the restaurant. The $5,000 buys you admission for 12, dinner for six in the Chef's Room, three bottles of Grey Goose, entrée to the VIP party in the Penthouse, plus a hotel room for two nights, which you may need to sleep it off. Haven't got $5,000? There are cheaper packages, and you can slip into the lounge and lobby for a mere $50. Red carpet, entertainment, DJs, plus video feeds to all the rooms, so you can see the whole party from wherever you are. "Nobody's ever done anything on this scale in Honolulu. Ever," said Flash. "We've either bitten off more than we chew or we're going to be party geniuses."